Of the “Original Seven” Mercury astronauts, Gus Grissom, the runt of the litter, has also gotten the shortest shrift in the public mind. Regarded at the time of his death in the January 1967 Apollo 1 fire as a prime candidate to be the first man to walk on the Moon, Grissom was posthumously eviscerated by Tom Wolfe in The Right Stuff, as Wolfe created a foil for his heroic portrait of all-star test-pilot Chuck Yeager. There, and in the movie made from Wolfe’s bestseller, Grissom was transformed in the public mind into “Little Gus” or “Gruff Gus,” the plodding, Hoosier-dull, slightly incompetent antithesis of superhero Yeager. Wolfe’s caricature did both history and the memory of Gus Grissom a terrible disservice. Thus the best thing to be said about George Leopold’s book Calculated Risk is that it corrects Wolfe’s numerous historical errors and, in doing so, restores Grissom to where he belongs: in the first rank of the pantheon of heroes of manned space exploration. After an unexceptional boyhood in Mitchell, Indiana, Virgil I. Grissom took off, as a man and a pilot, when his adolescent fascination with aviation led him into the U.S. Army Air Corps during World War II and then to Purdue University, one of the great engineering schools in the world (and to this day one of the institutions of higher education that produces the most astronauts). As a junior officer in the newly created U.S. Air Force, Grissom flew a hundred combat missions in Korea before graduating in 1957 from the Air Force’s Test Pilot School and testing one new aircraft design after another at Ohio’s Wright-Patterson Air Force Base. Which, among other things, gives the lie to Wolfe’s suggestion, in The Right Stuff, that the Mercury Seven astronauts were somehow second-stringers in the flight-test fraternity — “Spam in a can” who wouldn’t be doing any real flying. On the contrary, and notwithstanding the invaluable contributions made to the Mercury, Gemini, and Apollo programs by a diverse group of scientists and engineers, Calculated Risk makes it clear that the astronaut corps played a significant role in the development of spaceflight. From the beginning, they were most certainly not just passengers, chosen merely because they could take the pressures of high-G flight environments. After volunteering and making it through the screening process, Grissom accepted NASA’s invitation to join the Mercury program because he understood that this was “where the future of test piloting lay.” He had always wanted to go higher and faster, and Project Mercury and its follow-ons, Gemini and Apollo, were the tickets to achieve that ambition. That Gus Grissom made the first cut in a contest involving some of the most competitive men on the planet suggests that his Hoosier grit was wedded to professional competence of a high order. George Leopold, a technology journalist and science writer, is at his best in vindicating Grissom’s conduct during the mission of Liberty Bell 7, the second human suborbital spaceflight by an American, in July 1961. As Leopold puts it pungently (and accurately), Tom Wolfe “fictionalized” Grissom’s mission, suggesting that a panicky astronaut had “screwed the pooch” by inadvertently firing the mechanism that blew open the capsule’s hatch while the spacecraft bobbed in the Atlantic Ocean — an emergency in which Liberty Bell 7 was lost and Grissom almost drowned. Leopold demonstrates that the blown hatch was the result of a faulty design and an electrostatic discharge from the recovery helicopter; that Grissom maintained his cool throughout the ordeal, risking his life to try to save the sinking spacecraft; and that the incident did not do permanent damage to Grissom’s reputation for either courage or competence within NASA — as evidenced by his commanding the first two-man Gemini mission (making him the first human being to be in space twice) and then getting the command pilot assignment on the first Apollo flight. In fact, if Grissom had been listened to more carefully, the Apollo 1 launch-pad fire disaster that cost Grissom his life and killed crewmates Ed White and Roger Chafee might not have happened. Grissom, the highly competent engineer and veteran test pilot, strongly suspected that the Block 1 Apollo spacecraft designed by North American Aviation was a lemon: a death-trap in which various engineering tradeoffs involving a pure-oxygen internal spacecraft atmosphere had created a tinder box in which a single spark from faulty and exposed wiring would cause an instant and catastrophic conflagration. Moreover, North American was ill-organized to build the Apollo spacecraft, its management structure so diffuse that there was no one to respond to the astronauts’ concerns about the machine they were to take into Earth’s orbit and beyond. Thus Grissom was not sardonically joking, Yeager-style, when he said, at a pre-flight press conference, that a “successful flight” of Apollo 1 would be one in which “all three of us get back.” The press completely missed the point, but Grissom was signaling his deep concern that the Block 1 Apollo spacecraft was unfit to fly. Yet, like virtually everyone else in NASA in late 1966, Gus Grissom was caught up in what fellow Original Seven astronaut Walter Schirra later called “Go Fever”: the passion to just “keep going,” fixing things and solving problems on the run, in order to meet the challenge of the late President John Kennedy’s pledge to land a man on the Moon and return him safely to Earth during the 1960s. “Go Fever” was one part of what Leopold describes as a deepening culture of hubris at NASA, as the success of the Mercury and Gemini programs — remarkable achievements in which everything, as in Apollo, had to be invented from scratch — led to overconfidence, corner-cutting, and, eventually, the fire on January 27, 1967, in which Grissom, White, and Chafee died. Leopold clears up another myth, according to which the Apollo 1 crew panicked when fire broke out in the spacecraft cockpit during a “plugs-out” test on the launch pad at Cape Kennedy — a test designed to see if the spacecraft could operate without outside power and oxygen. 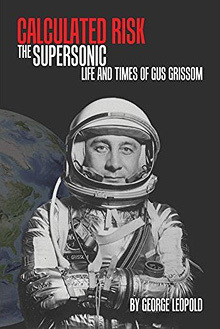 After painstakingly studying the evidence, Leopold concludes that, during the twenty-five-second fire that killed them, “Commander, senior pilot, and pilot acted precisely as they were trained to do in an emergency.” Gus Grissom, in sum, was a professional to the very end. And while he didn’t walk on the Moon, his death may well have made it possible for other men to do so. The Apollo 1 disaster led to a wholesale reevaluation of the Apollo spacecraft, and the result of that comprehensive overhaul — the Block II Apollo command module — took twelve men to the Moon (and twelve more around it) and got them home safely. For all its interesting information and its important corrections of the historical record, Calculated Risk would have benefited from more aggressive editing. Sentences are repeated, virtually verbatim, within a dozen pages of each other, and even entire episodes are retold. George Leopold’s disdain for Tom Wolfe’s fictionalizing is somewhat undercut by his own use of Wolfeisms, such as the astronauts laying their “hides on the line.” Leopold adapts without acknowledgement a line of dialogue from Tom Hanks as Jim Lovell in the movie Apollo 13, writing that, in Gemini 3, Gus Grissom and John Young had replaced “Sir Isaac Newton in the driver’s seat.” Astronomical objects and phenomena are misspelled (“Alpha Centuri” and “Beta Centuri”), and an entire chapter on the Mercury astronauts’ “extracurricular activities” is an exercise in posthumous, long-distance psychological analysis that the book could have well done without. Those flaws notwithstanding, Calculated Risk intends to be, and succeeds at being, a tribute to an unsung American hero, a patriot who believed that his country was on the right side of the Cold War and that his vocation as a test pilot and astronaut could contribute to the victory of freedom. Gus Grissom was right about that. And it is a fitting tribute to his self-sacrifice that the cartoon Grissom of The Right Stuff has now been superseded by the man in full of Calculated Risk. George Weigel is Distinguished Senior Fellow of the Ethics and Public Policy Center, where he holds the William E. Simon Chair in Catholic Studies. He is the author of numerous books, including the forthcoming Lessons in Hope: My Unexpected Life with St. John Paul II (Basic, 2017). George Weigel, "Grit, Gus, and Glory," The New Atlantis, Number 52, Spring 2017, pp. 128–131.